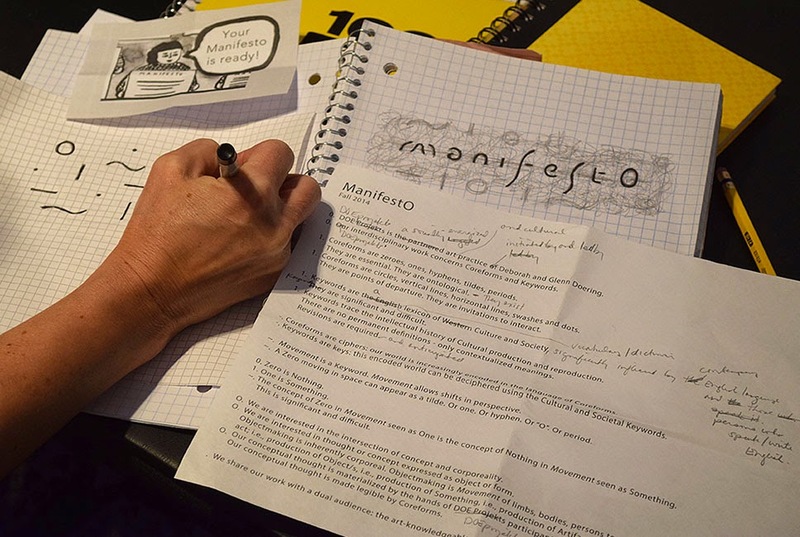 This autumn, DOEprojekts has been in dialog with Anaïs Duplan and Kione Kochi, lead artists, writers, and performers for ManifeStation, a manifesto writing project. We met face-to-face with ManifeStation at the Flux Factory in Long Island City, NY, and spoke about our passions, our hopes and fears, where we have been and where we hope to go with our art and cultural practice. 0. DOEprojekts is a socially-energized art and cultural practice initiated by Deborah Adams Doering and led by Deborah and Glenn N. Doering. 0. DOEprojekts' interdisciplinary work concerns Coreforms and Keywords. 1. Coreforms are zeroes, ones, hyphens, tildes, periods. They are essential. They are ontological. 1. Coreforms are circles, vertical lines, horizontal lines, swashes and dots. They are points of departure. They are invitations to interact. 1. Keywords are a lexicon significantly influenced by our contemporary English language and those persons who speak/write English. Keywords are significant and difficult. 1. Keywords trace the intellectual history of cultural production and reproduction. There are no permanent definitions, only contextualized meanings. Revisions are required and anticipated. —. Coreforms are ciphers: our world is increasingly encoded in the language of Coreforms. —. Keywords are keys: this encoded world can be deciphered using the Cultural and Societal Keywords. ~. Movement is a Keyword. Movement allows shifts in perspective. ~. A Zero moving in space can appear as a tilde. Or one. Or hyphen. Or "O". Or period. ~. The concept of Zero in Movement seen as One is the concept of Nothing in Movement seen as Something. This is significant and difficult. O. We are interested in the intersection of concept and corporeality, experiences and artifacts. O. We are interested in thought or concept expressed as object or form. O. Objectmaking is inherently corporeal. Objectmaking is movement of limbs, bodies, persons to perform the creative act; i.e., production of Object/s, i.e., production of Something, i.e., production of Artifact. O. Our conceptual thought is materialized by the hands of DOEprojekts participants. Our conceptual thought is made legible by Coreforms. We share our work with a dual audience: the art-knowledgeable and the art-interested.